Curtis Lowery, M.D., left, pauses during a live video conference. Lowery founded the AR SAVES program, which has been named one of three national finalists for the Hearst Health Prize. Jan. 31, 2019 | The Arkansas SAVES telemedicine stroke program, led by the University of Arkansas for Medical Sciences (UAMS), has been named one of three national finalists for the 2019 Hearst Health Prize for Excellence in Population Health. 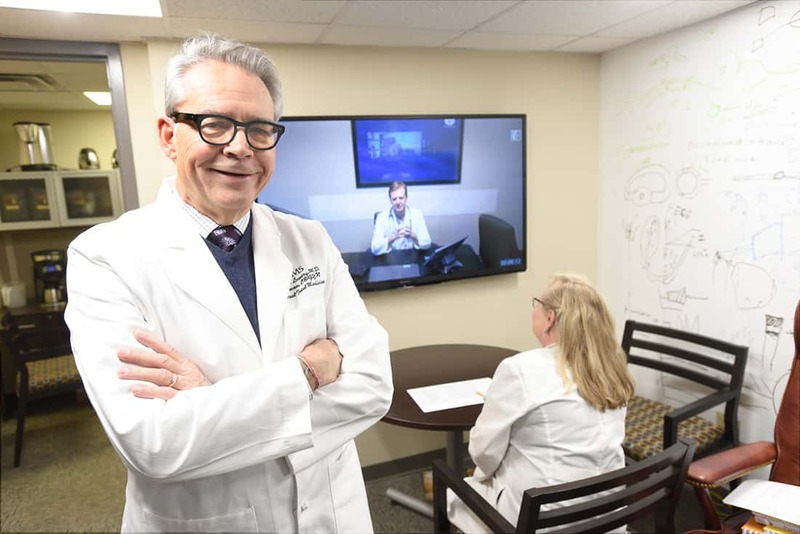 Founded in 2008 by UAMS’ Curtis Lowery, M.D., the Arkansas Stroke Assistance through Virtual Emergency Support (AR SAVES) program links patients in rural emergency rooms to remote neurologists through interactive video to diagnose and treat stroke. The prize winner will be announced March 19 at the Population Health Colloquium in Philadelphia and will receive a $100,000 cash prize. Lowery will represent AR SAVES at the meeting. AR SAVES has helped Arkansas drop its stroke mortality standing from number one in the nation to number seven, and 99 percent of Arkansans now live within a 60-minute drive of an AR SAVES site, a dramatic increase from 38 percent in 2009. A partnership between the UAMS Institute for Digital Health and Healthcare Innovation — also founded by Lowery, the state Department of Human Services and 55 participating hospitals, AR SAVES provides support 24 hours a day. One of the program’s stroke neurologists evaluates whether emergency room physicians should use a powerful blood-clot dissolving agent within the critical four-and-a-half-hour period following the first signs of stroke. When Arkansas SAVES was created, its high ranking for stroke death was attributed partly to a lack of stroke awareness and access to neurological support because of the inability for small, rural, and critical access hospitals to afford these specialists. Potential stroke victims would be transported to the nearest hospital with a neurologist on call, often hours away. The time delays adversely affected the chances of stroke survival and avoiding long-term stroke injury. Public knowledge of stroke symptoms was also low, with no organized educational effort to inform the public of these symptoms and what to do in the event of stroke. Arkansans were suffering the long-term consequences resulting from untreated strokes, including death. Arkansas SAVES is increasing Arkansans’ awareness through multiple campaigns, some of which include local media. Hospital nurse facilitators are encouraged to provide two public awareness events per month in their communities. This translates into more than 1,500 outreach activities a year for stroke education throughout Arkansas.